The penultimate round of the Wenneker Swizzle Masters challenged bartenders from around the world to create a stylish and classic Art Deco-inspired Cognac cocktail. 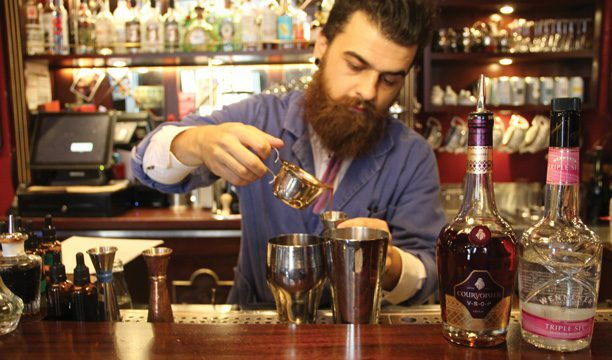 For round eight of the Wenneker Swizzle Masters competition, bartenders were tasked with using Courvoisier VSOP Cognac to create an elegant cocktail inspired by the ‘Roaring Twenties’ – using at least a dash of Wenneker Liqueurs. With the jazz age coming back in a big way, Art Deco was a timely theme for the latest round, and Swizzlers attempted to evoke the same sleek, anti-traditional elegance that symbolised wealth and sophistication all those years ago in their cocktail creations. Judges gathered at The Zetter Townhouse, Marylebone, where bartender Marzio Di Rocco recreated the top selected recipes to the exact specifications. Thomas Haring, general manager, The Harcourt; Nicola Poli, bartender, The Harcourt; Stephen Ruse, bar manager, Clarendon Cocktail Cellar; and Amy Hopkins, deputy editor of The Spirits Business, were charged with tasting the shortlisted recipes. “There was a very good selection of cocktails amongst the whole competition, and most of them were very well thought through,” mused Haring, looking back over the competition. Deemed “extremely elegant” with plenty of “warmth and character”, the “very drinkable” winner was Francesco Montesano’s Mon Sherry, created by combining Courvoisier VSOP Cognac with Wenneker Creme de Cacao, Sherry Nectar Pedro Ximenez, Campari and two dashes of chocolate bitters. 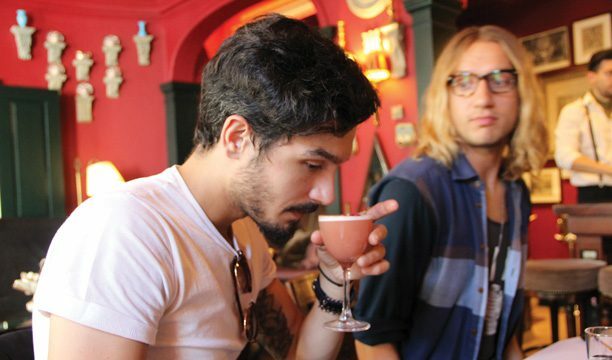 Second place was awarded to Pedro Arantes’s Heartbreaker. The “well-balanced” cocktail with a “beautiful aroma” consisted of Courvoisier VSOP Cognac, Wenneker Cinnamon Red, Ancho Reyes Liqueur and Taylor’s Fine Tawny Port. Third place was awarded to Kriss Kovy’s Evoquer Le Charme, which was deemed “sweet but balanced” and “fresh and pleasant”. The serve is a combination of Courvoisier VSOP Cognac, Wenneker Butterscotch, Wenneker Creme de Cacao, Wenneker Coffee and Wenneker Amaretto. She continued: “The vast majority of entries in this round stuck to the Art Deco brief very well, and produced some really inventive recipes that showcased the Wenneker and Courvoisier beautifully. We tasted everything, from cream to sparkling and short to tall fruity drinks, showing the diversity of Cognac cocktails. Montesano’s recipe will now go through to the semi-final in October, when all nine winning drinks from throughout the year will be recreated once more and judged against each other. Five drinks will then be chosen to go through to the grand final in November. The bartender behind the winning recipe will be crowned Wenneker Swizzle Master 2016 and scoop £1,000.